Angel’s Veil. 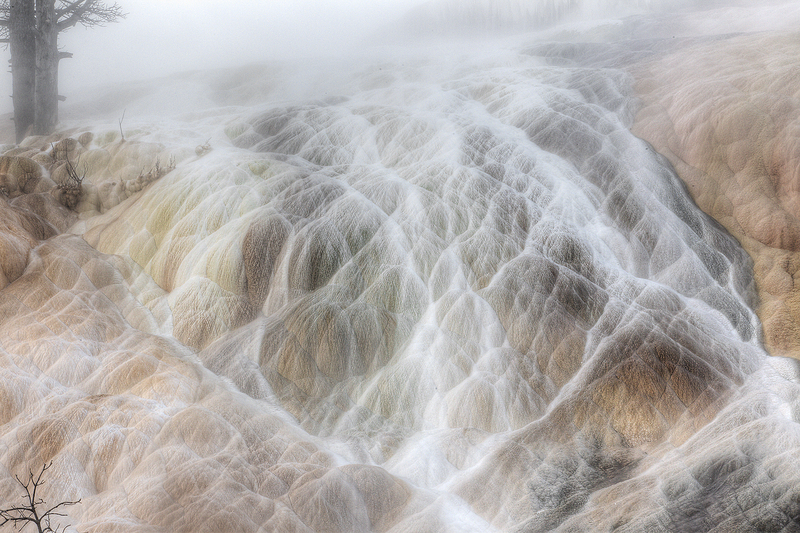 Mammoth Hot Springs, Yellowstone National Park, MT. This HDR was created from a five-image AEB series made with the tripod-mounted Canon 70-200mm f/2.8L IS II lens) and Canon EOS-1D Mark IV). ISO 400. Evaluative metering +1 stop: the base exposure was 1/8 sec. at f/22. The AEB sequence was +/- 1 stop around the base exposure. For a greater appreciation of the image, click on the photo. Then click on the enlarged version to close it. The image above is presented for your critique; feel free to praise it or rip it to shreds. All suggestions are welcome. Would you keep it or delete it? Let us know why either way, what you like or what you hate. What would you have done differently? Over the course of the next two months or so, I will present ten additional images in this series for a total of twenty in all. The last will be followed by several revelations including two major ones. Earn Free Contest Entries and Support both the Bulletins and the Blog by making all your B & H purchases here. More and more folks are earning multiple contest entries with their B & H purchases. See here for details on that. Eleven great categories, 34 winning and honored images, and prize pools valued in excess of $20,000. Click here to visit the competition home page. Below is a list of the gear used to create the image in today’s blog post. Thanks a stack to all who have used the Shopper’s Guide links to purchase their gear as a thank you for all the free information that we bring you on the Blog and in the Bulletins. Before you purchase anything be sure to check out the advice in our Shopper’s Guide. Canon 70-200mm f/2.8L IS II lens. Man, I am loving this lens on my shoulder with the 2X III teleconverter. I also use it a lot with the 1.4X III TC. Canon EOS-1D Mark IV User’s Guide. Learn to use your Mark IV the way that I use mine. Also available for the 7D and the Mark III here. What a great image. Doing anything more to it seems like a waste of time at best. For sure the twiggy little plant at the bottom left should not be removed. I really like your HDR image. The tree branch in the lower left of the frame is a distraction. There seems to be some noise in the image. Was it left there intentionally? Wonderful image design. I would leave it as is. The trees along the top edge of the frame and the main two in the upper left corner, along with the twigs in the bottom left all give this image a sense of place. Wow, I love it…except for the little branches on the lower left side of the frame. Maybe they could be eliminated? I find them distracting from the other movement of the picture. I’m feeling they are too static. The upper left anchors the shot even though they are diffused. Maybe reduce the intensity of the brances or eliminate them is my suggestion. I think it is an awesome shot otherwise! Hi Artie. I like the image, very artistic, pun intended. I haven’t delved in to HDR as yet myself, but this type of image seems to me to be ideal for that type of photography. I would want to lose that little twig, bottom left, but I love the image otherwise. I’m going to link to this photo from Ephotozine, there’s been lots of discussion regarding HDR on that site.